The Granite Gurus: Statuary Vein Marble--Half Slab for Sale! 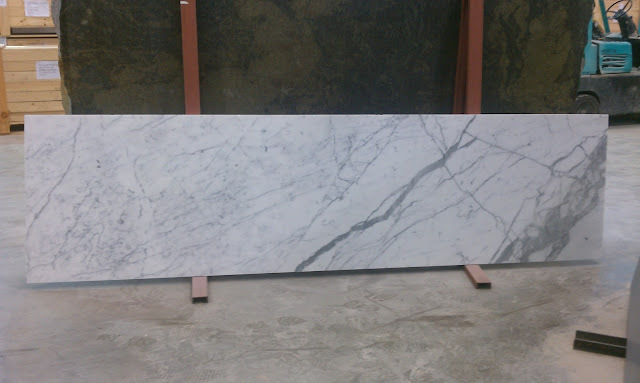 Statuary Vein Marble--Half Slab for Sale! We have a half slab of the oh-so-beautiful Statuary Vein marble for sale. We generally don't sell half slabs, so this is a great option if you have a vanity or furniture piece you need marble for and don't want to purchase a full slab. This slab is particularly pretty, it has some really nice muted grey veining that I just love. The slab is 124"x 34" and is 2 cm thick. Email me for details, questions and pricing.